After defeating Berkshire at home, the Vermont Wildcats entered Lossone last Wednesday afternoon and your host Williston Wildcats earned the victory behind a 13 save performance from Xander Rogers, 6-2. Williston was down early in the game when a Vermont player was able to deflect a point shot on the power play. However, at the 15:07 mark, James Belleavoine took exception to the lead and buried a puck past the Vermont goalie Dylan Regan on an assist from the Sauce, Cam Mariani. Kyle Caddo wanted a piece of the action and just a minute later, beat Regan on a blast with an assists from Belleavoine and Tim Rego. In the second, Williston added to their lead at the 1:49 mark when Captain Sam Milnes went in on a 2-1 with freshman David Novotony charging down the center of the ice. In a move taken from the St. Sebastian’s game, Milnes put a puck right on the tape of Novo who buried the puck. At the 14:14 mark, the exact same thing happened again. (No need for a recap, just read above.) Connor Canterbury decided to get in on the action when he took a puck on the left point, walked in a few strides and let a blast go just above the circle tops. For the Alaskan Assassin, this was his first goal of the year. Logan Geisness and Billy Smith earned the helpers. Then just two minutes later, Sam Milnes made the game 6-1 when he put in a greasy goal on the doorstep with assists from Geisness and Brandon McGill. The third period featured only one goal by Vermont, but was highlighted primarily by the text book game management of the Williston group. Canterbury earned the game puck. On Saturday, the Gunnery Highlanders came to town. This would be the only meeting of the season between the two clubs due to a snowstorm that cancelled the Williston trip to Washington, CT. In a highly physical and contentious game, there were no goals scored in the first period. In the second, Gunnery was able to score when the puck could not be cleared by Williston. Gunnery scored their second goal on the power play at the 11:47 mark. Later in the period, Kevin Lassman pulled the ‘Cats to within one when he skated into the Gunnery zone and beat goalie, JP Mella. Assists when to Geisness and Smith. However, that would be as close as Williston would get. The Wildcats dropped the contest 2-1. Goalie Greg Iverson played very well making 32 saves in the loss. This past Wednesday, Williston packed their bags once again and headed out to the great state of New York and home of the New York Yankees and the Erie Canal! Millbrook was battling a bout of illness but their Pink in the Rink game gave them extra strength to make a game out of the day, but Williston would overcome and win 4-3 in overtime. Not making the trip was captain Sam Milnes who battled his own illness. Keeping him home was like trying to put a ten foot tiger into a nine foot cage, but health services was able to do it. Williston started the first period with a set game plan and executed it swimmingly. Williston maintained heavy pressure all period and even gaining a 5-3 advantage at one point, but to no avail. Both teams entered the dressing rooms locked a zeroes. In the second period, Millbrook got on the board on their own 5-3 at the 3:10 mark. Williston would even the frame at the 15:35 mark when Billy Smith worked the puck to Tim Rego who skated in the zone on the left hand side, took a shot, collected his rebound, went behind the net and slid a sweet pass to Brendan Hansen right on the doorstep. The puck went through a hole and Williston was happy. In the third, Williston took the lead at the 2:43 mark when Hunter Sarro took pass from Brendan Hansen and buried shot from 20 feet out. Canterbury earned the assist. Cheese-head Brandon McGill made it 3-1 when he let a laser go from the right wing that beat Millbrook goalie Cam Fernandez on the far side at the 8:30 mark. Williston was feeling good about itself but two untimely penalties got Millbrook to even the score, the final goal coming with just 50 seconds left. Overtime was to determine the fate of the two teams. In OT, both clubs had a number of scoring opportunities and Williston goalie, Xander Rogers was up to the task. Williston, on the other hand, wanted to leave Upstate New York with a win and it came with just 12 seconds left when Geisness let a shot go from the right half-wall that Billy Smith, with hands like a surgeon, was able to corral between Fernandez’ five-hole. Williston’s arms went up, moms’ tears fell down, and Williston boarded the bus with Four Brothers Pizza and a win. Smith earned the game puck. Rogers made 35 saves. On Saturday Williston headed down to Southwest Connecticut to face the Brunswick Bruins. While the Wildcats would lead by two goals twice in the game, penalties proved to be their Achilles heel as the Bruins converted on three power play opportunities. Brunswick took the game 4-3. The period opened with both clubs feeling one another out. Ethan Agostoni got Williston on the board at the 12:32 mark of the first period when he jammed in a puck on the side of the net. Connor Power got the assist. Sam Milnes put Williston up by two a minute later when he took control in the offensive zone skated around a myriad of players and beating Bruin goalie Dan Dachille in the slot. Brunswick got a late goal in the period on the power play on a rebound opportunity. Williston looked like they would continue to roll when a 1:23 into the 2nd period, Mariani pick-pocketed a Bruin defensemen behind the net and put a shot on Dachille that was saved, but Billy Smith poked in the rebound. However, Williston would go on the penalty kill and Brunswick took advantage netting two opportunities. They would get eventual game winner with 8:46 in the period. While Coach Cunha tried to rally the Wildcats with a Charles Dickinson-esque speech between periods, it was to no avail. Greg Iverson made 31/35 saves on the day. Williston plays Westminster tonight at Lossone at 5. Williston beat Westminster last year in overtime and no doubt the Martlets would like to repay the favor this year. Great seats are still available. 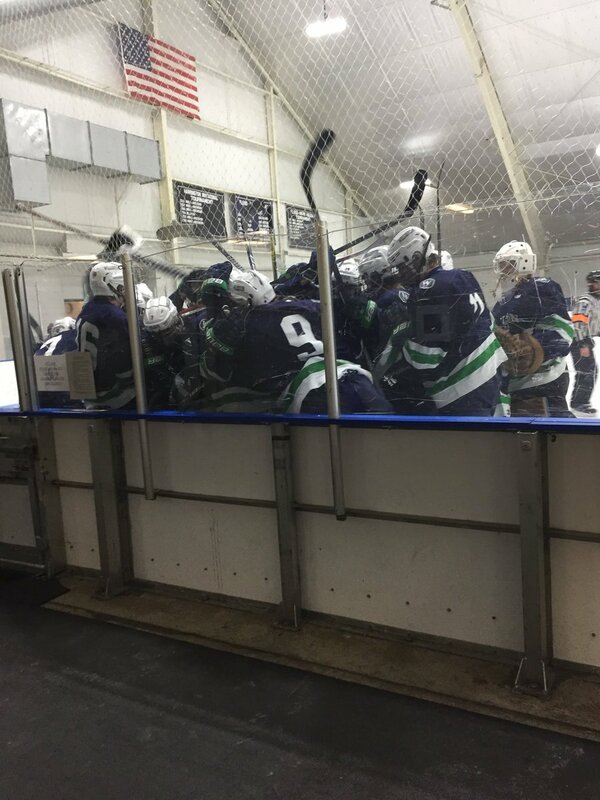 Williston won their second and third straight games after Christmas defeating Nobles 3-2 and St. Sebastians 4-3 in OT. The two wins put the team’s record at 5-3-1. In last season’s pre-/post-Christmas games, Williston went an unimpressive 1-4. This year, they turned the tables and went 3-1-1. Wildcats from across the United States reunited at the Noble’s rink for an hour skate last Thursday night in preparation for their two contests. For being off for just under two weeks, the club looked solid and crisp and became reacquainted with one another rather quickly. Following the skate, the team met family and friends at The Chateau in Norwood for an Italian dinner that couldn’t be beat. The dinner has been a staple for Williston hockey as it has brought parents and players together for the past number of years and has been a really great kick-off to the meat of their season. The following day, Williston had the late game at St. Sebastian’s versus a talented Nobles team. Greg Iverson got the nod in goal for the game and did not disappoint making 30 saves to secure the win. Tim Rego got the ‘Cats on the board at the 9:08 mark of the first period when he took a pass from Billy Smith and ripped a shot from the point thought a screen beating Nobles’ goalie Matt Lane. Then, just three minutes later on a power play and with Williston setting up a shooting gallery in the offensive zone, Rego got his second of the game. After ringing the cross bar, Rego remained patient, took a pass from the left hash mark and drove to the net from the left side and beat Lane again. Logan Geisness earned the helper. In the second, Nobles got their first goal off a rush up the ice from a shot that was tipped, beating Iverson. The teams ended the period 2-1. In the third period, freshman David Novotny scored his first of two game-winning goals on the weekend when cleaning up on a Sam Milnes breakaway miss that got jammed on the right post. Novotny with the quickness of a jackrabbit pounced on the rebound. Nobles would score to cut the lead to one but Williston’s stingy defense and goaltending kept the lead secure for the win. The game puck went to Tim Rego for his two-goal night. The next day, Williston crossed to the other side of 95 to Dedham to take on a strong St. Sebastian’s team that contains five Division I commits. Williston got out of the gate rather sluggishly and looked flat for the first third of the period. St. Sebastians, on the other hand, came out swinging and in the first six minutes beat Williston goalie Xander Rogers three times. The opening goal came off a 5×3 power play opportunity and the second shortly after still man up 5×4. Trying to change the momentum, the Williston coaching staff decided to replace Rogers with Iverson. There was no scoring in the rest of the period but Williston’s play altered and they gained a number of opportunities. Williston entered the second period with the mindset of chipping away at the Sebs’ lead. It took some time as both Williston and St. Sebs battled back and forth for much of the period. However, at the 11:13 mark of the period, Billy Smith broke the juggernaut. On a pass from Alex Berg, Billy crossed over the Sebs’ blueline on the right side, cut to the middle and let a Hyde Park Howitzer go from three feet inside the line, deflecting off the Sebs’ goaltender’s stick and finding the back of the net. The goal energized the Wildcats and they entered the dressing room with a glimmer of hope and some intensity. In the third, Williston and Sebs traded blows with neither team budging until the 10:23 mark when, on the power play, Logan Geisness worked the puck to Brendan Hansen who fired a shot that was tipped in by Sam Milnes to bring the score to within one. Then, after a time-out with under two minutes to go, Williston was able to get the puck into the St. Sebs’ zone and with just twelve seconds left, Milnes put a dart of a shot into the short-side top corner of the Sebs net from the goal line. With a delayed penalty at the same time, Williston went into overtime on the power play. In overtime, Williston was unable to get anything going with the man-up and after an offensive breakdown, had to haul down a Sebs player on a breakaway resulting in a penalty shot. Penalty shots are rare, and in overtime would be considered non-existent, however the call was warranted and Iverson stood tall making the much needed save. Play went back and forth with few chances for either side until a loose puck corralled by Milnes in the neutral zone led to a 2-1 with David Novotny driving the net. Milnes held onto the puck looking to shoot and at the last moment made a saucer pass just over an outstretched Sebs’ defender’s stick that Novotny drove into the net. Game. Set. Match. Williston 4. St. Sebastian’s 3. Novotny earned the game puck for the night and Greg Iverson pitched a shutout saving all 27 shots he faced. Williston’s next game is on Wednesday when they take the mini busses down into Connecticut to face a very strong Canterbury Saints club. Good seats are still available.